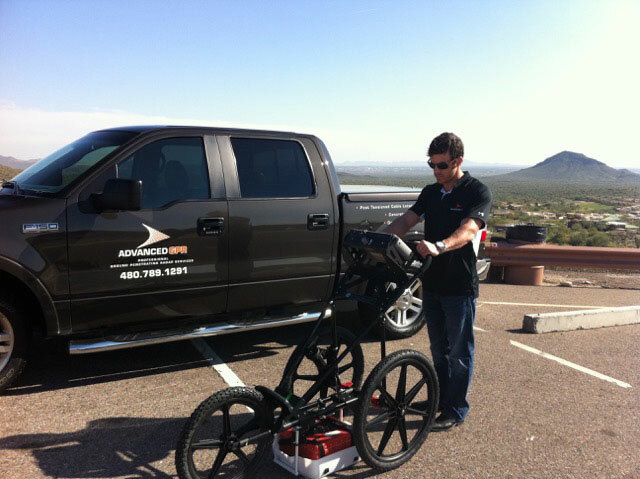 Non-Destructive - Ground Penetrating Radar provides a Non-Destructive means to locate items within materials. Operates anywhere - GPR can be used to visualize numerous materials, voids, cracks, and leaks at slab grade that X-Ray simply cannot do. No Radiation - GPR uses NO RADIATION!! There is no need to clear workers from any area because of the negative health effects of radioactive materials. This means less downtime for your jobsite. Reduces Time - GPR reduces the time needed to meet your deadlines. GPR can locate items in realtime avoiding film developing times. GPR operates in realtime. Scans are available within minutes. Electromagnetic Radar waves are passed through concrete, earth, etc. and reflected off of anything in their path. The reflected wave data is retrieved and interpreted by a certified GPR Technician. A leaking pipe at slab grade was identified to limit the digging necessary to replace the segment of pipe below a residential property. The location of a leak in a subsurface pipe is undetectable by any other means. An underground tank was located using GPR for replacement. The tank was to be reused for another purpose and could not be damaged. GPR was used to locate the tank. The size, shape, and depth were located quickly and the tank successfully removed. If concrete coring is being done the technician will identify a safe area without cutting rebar or Post Tension Cables. Ground Penetrating Radar can aid Law Enforcement by locating evidence or burial grounds.